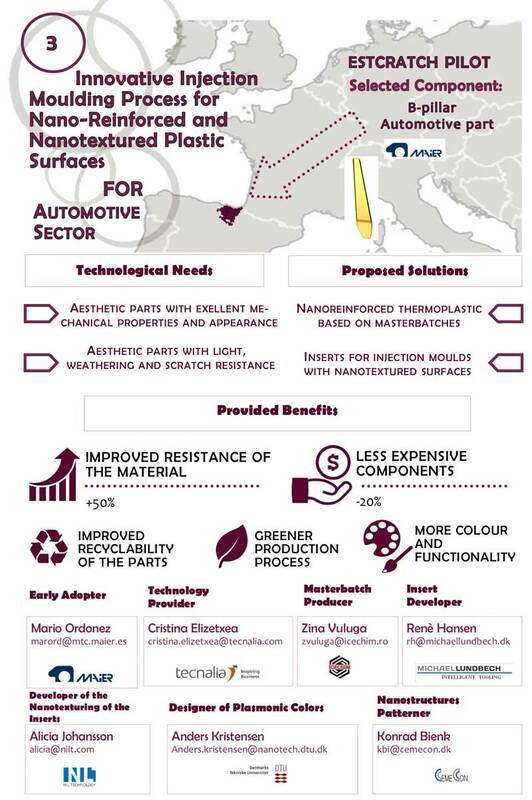 Izadi-Nano2Industry proposes different solutions based on KETS such as nanotechnology, advanced materials and advance manufacturing that are implemented in three innovative PILOTS (ESTCRATCH, HARDcast and TRIBOnano). Each Pilot manufacture new performance-enhance components, integrating safe-by-design approaches into all the development stages. injection moulds with nanotextured surfaces are used to produce innovative aesthetic parts for the automotive sector with both excellent mechanical properties and appearance, and light, weathering and scratch resistance (+50% material resistance, -20% component cost, improved recyclability, greener production process, more colour and functionality). In HARDCAST Pilot, nano-reinforcements are added and dispersed via master-pellets. 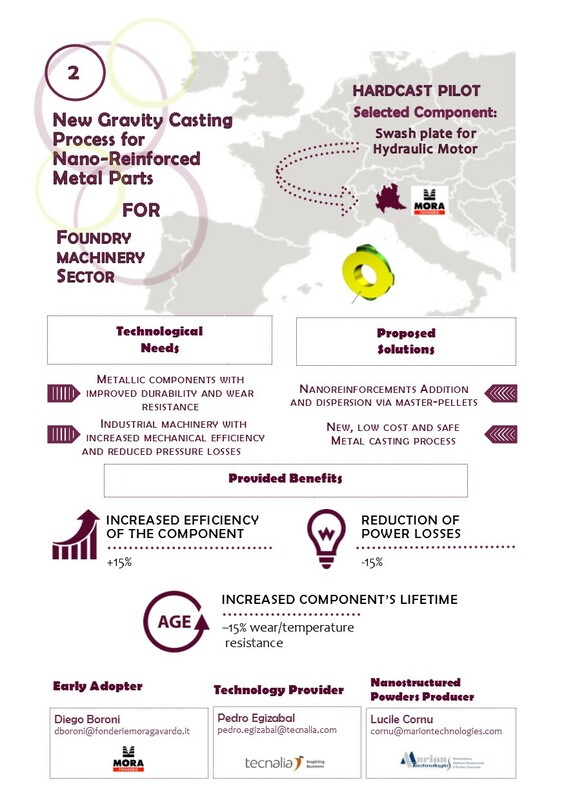 It is a new, low cost and safe gravity casting process concept to cast metallic components with improved durability and wear resistance (+15% component efficiency, -15% of power losses, +15% of wear/temperature). 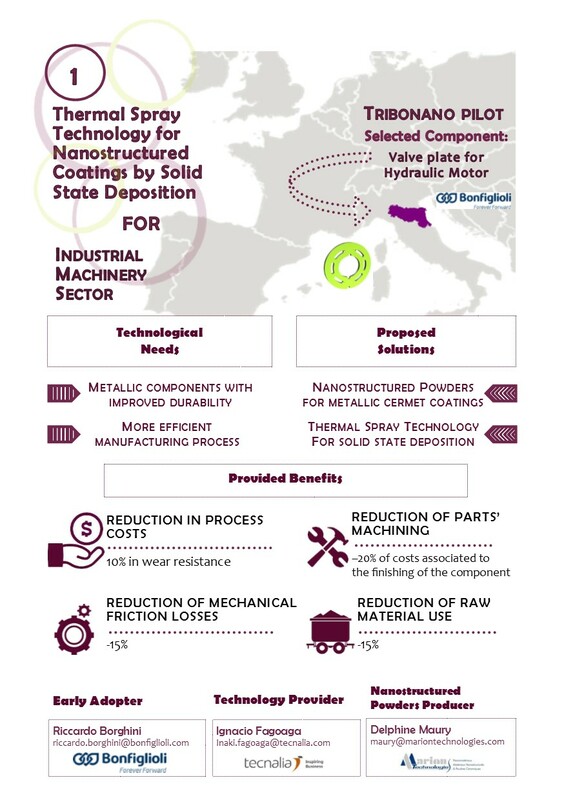 In TRIBONANO Pilot, nanostructured powders for metallic cermet coatings and thermal spray technology for solid state deposition are combined to have more durable metallic parts in a more efficient way (+10% wear resistance, -20% of costs associated to the finishing of the component, -15% mechanical friction losses, -15% of material used).